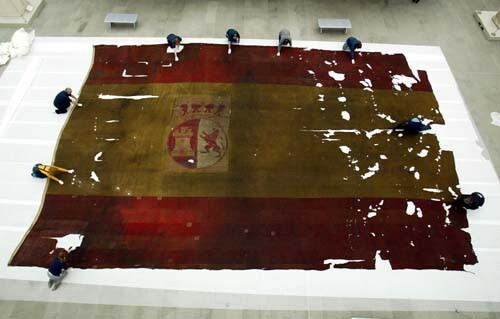 This naval ensign, captured from the 74-gun Spanish warship, San Ildefonso, was displayed for one day only at the Museum, on 10 February 2005. This was probably the first (and last time) to see the object for many years. The exhibition was part of the lead-up to the opening of the Nelson & Napoleon exhibition and a host of Nelson-related activities as part of the SeaBritain 2005 programme. Measuring 10m x 14.5m and made of wool, this iconic object hung in the crossing of St Paul's Cathedral during Nelson's funeral service on 9 January 1806 and was presented to the Royal Naval Museum by the Dean and Chapter of St Paul's in 1907. The damaged caused at the Battle of Trafalgar can clearly be seen. The design for this ensign was in use from 1785-1931. The field is divided into three horizontal red/yellow/red stripes. On an applied patch in the central stripe is an oval containing the arms of Castile (a yellow castle on a red field) and Leon (a white field with a red rampant lion), a crown above. The arms appear the have been printed or stencilled. Inscribed on the hoist in ink: 'SAN ILDEFONSO'. The flag is made of wool bunting, woven 1 ply x 1 ply, 29 threads to the inch (warp), 28 threads to the inch (weft). Made of 21, 405mm wide breadths, hand-sewn horizontally with overstitched seams. There is a narrower band of fabric at the top and bottom edge. There are some rectangular holes probably cut by souvenir hunters at the hoist end and neat patches indicating repairs made soon after the date of manufacture. The ensign has a linen hoist containing a rope. 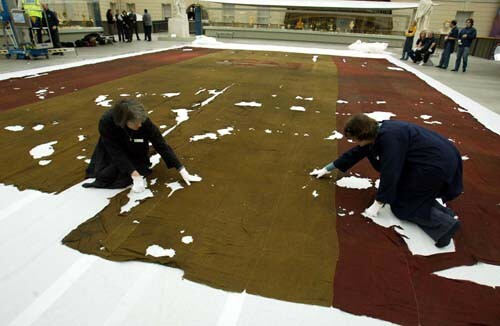 A very similar ensign, worn by San Juan Nepumeceno during the battle of Trafalgar, is in the collections of the Museo de Ejército, Madrid.